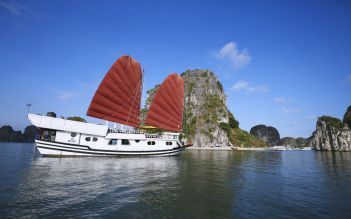 With one day tour, Dragon Bay boat takes you in comfort and the most leisurely cruising trip to explore natural beauty of Halong bay and get the chance to get “off the beaten track” and explore the secrets of the sea within Bai Tu Long area. Besides, you will also experience kayaking, cave visiting, fishing village… in a limited time. Over 8 years old: 100% of adult's fare and serve as an adult. 10:00: Arrive at Vung Vieng fishing village, explore this area by rowing bamboo boat with the local people, visit fish farm and pearl farm. 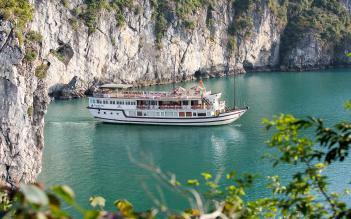 13:00: Visit Thien Canh Son cave, explore the bay by kayaking and relax on the beach. 15:00: Cruise back toward harbor. 17:00: Disembark and say goodbye to the crew. 17.15: Get on transportation back Hanoi (optional). Trip ends . 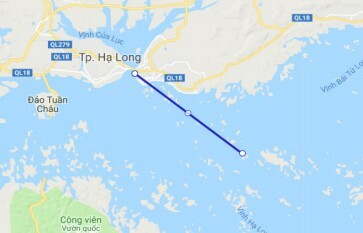 Hanoi – Halong (Day 1): Pick up from Hotel in Hanoi Old Quarter (7:30 – 8:00 AM) and transfer to Halong Bay. 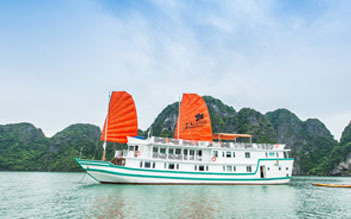 Free time and stay overnight at Halong city with your own arrangement ( or contact us for city tour and hotel booking) . 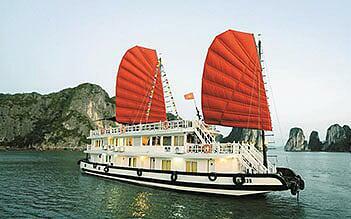 There are two stories that come from travelers who have gone to Ha Long Bay. One is bad Too many boats, I even heard of rats on ships and one is good. Dragon Legend was definitely on the good side. Nice ship I was on the Dragon Legend II which traveled to a less crowded part of the bay. The crew was attentive and fun. Picking the right company makes all the difference in the world. This one may cost a bit more than some of the others but it's worth it. This was a wonderful trip! The boat was extremely clean and very well taken care of. The activities were well organized with enough time for relaxing, eating, picture taking and even a massage on the boat! The massage was very well priced and they did an excellent job. The food was tasty and plentious. The tour guide wore so many hats but was very effective at his job. Our 14 and 10 year old were with us and they just loved it! We will certainly go back and will stay longer. Excellent tour!